What if I HAVE NEVER DONE KICKBOXING BEFORE? How many kickboxing classes should i do a week? A common question we get asked is how many days a week should I take class? The answer is everyday :) But most people..... almost everyone can not do that. So there are a lot of factors that go into answering this question. But generally speaking since our classes are 1 hour long, we recommend at least 2. That gives you 2 hours a week. If you are watching what you eat and making healthy choices at home and doing some exercise on the days you are not in for class then you should be making progress with your fitness plan. We are here to help and we really recommend 3 days a week, but we offer a class every night so you can do what fits into your schedule. Try our 3 class trial to see how much our fitness kickboxing program can help you reach your fitness goals. This topic is ever present in my kickboxing class. Our goal is to help you get in better healthier shape. Very often the people I talk to say " Im not in the shape I was 10 years ago". Or " I need to get back into shape". This is a great healthy attitude to have. But I want to make sure we all understand one thing. My good friend Morpheus says it best. My fear is some people might get an unrealistic idea that they should be in the same physical shape they were years and years ago. This is possible for some people. But we can all agree that LIFE HAPPENS and instead of trying to be what we once were we should focus on being the best version of us that we can be now. There is certain weight, and body fat, and muscle we can have on our body and still be healthy. I think this " challenge" as everyone is seeming to call it, is a good thing that might motivate people to make some changes. Its always fun to look back on life and see how things have changed. But there is no reason at all we should allow this to have a negative effect on us and give us this unrealistic goal of trying to be just as fast, strong, or fit in the same jeans we did 10 or 15 years ago. So if this has motivated you to try and change up your lifestyle a little and watch what you eat and work out a little more. Give us a call to schedule your first trial class. We help you get in better and great shape in a fun action packed class. One thing I learned early in my martial arts training and I have also heard this several times from many motivational speakers is that you have to write your goals down. If you do not write them down they are nothing more then a wish. I took this idea and ran with it. I now have a firm belief that if you don't write something down then your chances of doing it are less then if you do write it down. I know this is true for me. But lets apply this logic to your workout schedule. Lets first talk about your regular schedule which involves: home stuff, work, kids, activities, ...... Any person with a hectic life I hope has seen the benefit of writing out a schedule to manage their time better and if your like me it works. Now lets factor your workout into this. If you don't write it down in your " schedule" what are the odds that you will remember? How many times have we forgotten about a doctors appointment? Or a meeting at school? If you have a busy life/schedule then something like this would be easy to overlook. But if you write it down in your schedule and you check that every morning, then your good :) I personally also like to set a reminder on my phone so I get that as well. I don't do that with EVERYTHING, but when it is something out of the ordinary or a special event that is not all the time I will set a reminder on my phone. But if you do this with your workout routine and sit down and write down your times in your schedule then you are committed. In your mind you feel like its on the schedule I have to go. This is very helpful after the holidays. Not everyone is super excited to go back and workout after all that turkey. But if you workout is part of your schedule then you have no choice :) Think about this and I hope you try it and find it helpful. Our instructors help you throughout the entire class. We have to balance workout with instruction to make sure you are doing the kicks and punches correctly. Check out You will see that we like to use the term FITNESS KICKBOXING instead of the CARDIO KICKBOXING. I want to make sure people get the right idea of our classes. Now don't get me wrong, there is nothing wrong with cardio kickboxing. What I mean is when people hear cardio kickboxing they get this image that all the punches and kicks are done in the air. Kind of like a zumba class. I'll say this again, there is nothing wrong with zumba :) Im just using that as an example. But our class allows you to hit the bag. This gives you lot of resistance and helps develop more tone muscle and strengthen them at the same time because there is weight there you have to work against. We sometimes will mix in some punching and kicking in the air because that has good benefits as well. Check out this video of one of our classes. Just think. This could be you! Recently I was talking about being happy and confident with yourself and your body. In todays society we have this idea that we have to be in perfect shape, super skinny and toned up. 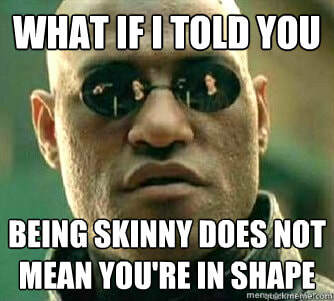 Well as the picture below says, being skinny doesn't mean your healthy or in shape. Yes it is true that to much body fat is not good for you. But we need body fat. It is good to have a certain amount of muscle. But not so much as like a body builder would have. So I was talking about being happy and confident with your physical fitness. I personally do not have 6 pack abs. But as a guy I am not self conscious about someone seeing me with my shirt off if we are at the beach or something. I hope my students will gain confidence with themselves and their abilities in class and I hope that will transfer to other areas of their life. So let me re-phrase this. Can you do more situps now then when you started kickboxing? Can you last longer in class before taking a break then when you started? Can you do push ups now? If you are answering yes then you should be proud and happy and confident with your fitness and body image. Focus on the positives and all you have accomplished. How can you not be happy. DON'T LET YOUR WORKOUT INJURE YOU! Last night I had an old student come back and sign up. The reason I am talking about this in my blog today is because he is a physical therapist, and he would always back up what I was saying with the punches and kicks with is knowledge of how the body works. As a rough example I would tell everyone in class to make sure you do your hook punch this way and keep your arm in this position....... ( remember this is just a on the fly example right now) but I would then look at my student who is a physical therapist and he would think about it and say yup! That makes sense to do it that way so you dont hurt this muscle or that muscle or tear your rotator cuff. So my point with this is that when you come into our class we are not just showing you how to hit the bag with punches and kicks, we are making sure you are doing it the proper way to ensure you don't injure yourself. This student I was talking to last night was telling me about all the people he had been working with who had shoulder problems from doing kickboxing classes. It was scary. But we teach it the right way so that is why I don't see any of those injuries. This week we will be carrying on with our killer workout and its not secret that we are kind of doing the same things through out the entire class. But each time we do it in a different way so it is different, but it is using the same punches and kicks. Sometimes in your workout you like to do new things and keep it fresh. Other times is feels good to go back to the basics and train some things you don't need to think about. You can just do these drills pretty much with your eyes closed because you have been doing them for so long. But doing them back to back to back challenges your cardio :) Im looking forward to seeing you all in for great classes this week and if you are new to our class this week, don'y worry. You will have a blast. Master Quillen helps you through the whole class.